MAIN POINT: Inculcating sticky faith, in a 'post-it-note' world? While searching for a marketing application, Silva's colleague, Arthur Fry decides to use the adhesive for his music notes while singing for the Church choir. Often, the choir will struggle to keep the musical sheets together as any movement will cause the papers to fall all over the place. Just then, Fry remembers the adhesive back in the office and decides to use them for his choir notes. The application works like a champion for the church choir. The rest is history. The Post-It-Note pad becomes one of the most successful products ever to be launched by the 3M Corporation. 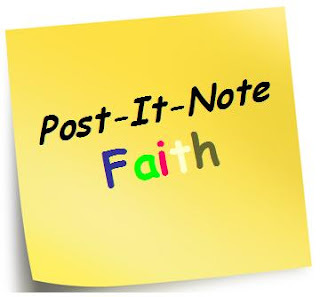 What is 'Post-It-Faith?' Simply put, it is another name for half-way faith, or temporal belief. When times are good, we keep the commandments and religious practices. We smile more. We thank God for blessing us. We shout 'Hallelujahs' and 'Praise God.' We chime in 'Glory to God' each time we receive good news. This is even more prevalent in places that promote a prosperity gospel. The basic premise of prosperity gospel is this. "God wants you to be rich. God wants to prosper you. Give and see how the Lord gives back to you even more. There is no reason why a God so rich will let any believer be so poor." The trouble with such a teaching is that it focuses more on faith rather than on God. By believing enough, one gets enough of God's blessings. Conversely, if God does not bless, such believers will blame themselves for their lack of faith. Such a faith is too dependent on results and tries to hem God in, to spiritually blackmail God into submission as if God is servant to man. True faith is never conditional upon God's promises. True faith is unconditional, and gives God absolute right to give and NOT to give. Unfortunately, people with a Post-It-Faith tends to be fair weather Christians rather than All-weather believers. Sometimes, Church people are guilty of inculcating a Post-It-Faith culture. Take a look at the evangelistic messages. Some well meaning but misguided Christians use the 'Abundant Life' approach to attract non believers. They quote John 10:10 and impress upon non-Christians that once they believe in Jesus, they will have a more abundant life, including a big increase in material things. "See! Once I believe in Jesus, my stocks soar. I am upgrading to a new BMW next month! Hallelujah! Praise God! Amen?" They use God as a Healer. "I used to be walking with a limp. The moment I believe in Jesus, I can walk again. I can even run like never before on both legs!" They use God as an emotional stopgate, that once they believe in Jesus, all their problems will be over. Words from certain songs are heavily into this positive emotionalism. For example, look at the words of the popular song, "Jesus we celebrate Your victory." Our hearts responding to His love. Do problems really 'disappear' magically when we see Jesus? Or are we drumming up some kind of a escapism from our worldly troubles? Didn't Jesus tell his disciples that in this world that they will have many troubles and sorrows? (John 16:33) It is one thing to claim that Jesus has overcome the world. It is yet another thing altogether to manipulate Jesus to become our problem solver. Reminder. We are Christians called to be witnesses for Christ, not spiritual salesmen. We cannot simply present half the story, but the whole story. Otherwise, if we present Jesus only as an Abundant Provider, an itinerant Healer, or a Problem Solver that we can wish into being like a genie in the bottle, we are doing our non-Christian friends a disservice. Worse, we are only sharing a half-way faith. We will be unwittingly raising a generation of Post-It-Faith people. When times are good, these people believe heartily. When time are bad, these people will leave. Such people who stick to the faith easily will also easily remove themselves from faith in bad times. The Parable of the Sower lists four different types of soil of which the last type is fruitful. Note Jesus's description of this last group. Matthew's gospel gets even more specific. Here, Jesus is using the parable in a metaphoric way. Prosperity gospel proponents will tend to measure it almost always in a materialistic way. Unfortunately, this is not what Jesus meant. Jesus is not talking about kingdom of diamonds, rubies, gold, or silver. He is talking about the kingdom of heaven. Note his introduction to the parable. It is the Word that Jesus is talking about, not materialistic things. It is the Word that becomes alive in a person. It is the Word that grows and multiplies into good works and fruitfulness that comes out of a transformed being. People who fail to let the Word become sticky on their hearts will easily fall away. Likewise, people with Post-It-Note type of faith will not stick around for very long. When the threats of persecution come, or the winds of change approach, they will be quick to flee the faith. Post-It-Note faith sticks during good times, but falls away when troubles come. How can we help inculcate a sticky faith? I suggest 3 Cs in our sharing of the Christian faith. Firstly, focus on having a conversation rather than aiming toward conversions. Having attended many training workshops on how to do evangelism, there is an overwhelming focus on trying to bring people to faith. In some cases, it is downright coercion that can be manipulative. I know of some church groups that use magic shows as a facade to invite non-believers to come. Thinking that these are entertainment events, the unsuspecting visitors are then treated to a short entertainment, followed by a long sermon on the Christian faith. Even as a Christian, I find the whole thing rather distasteful. While I acknowledge that God can use any situation to win souls, I feel that Christians ought not be ashamed of the power of the gospel in itself. We do not need magic shows, attractive events to fish for people. We need simply be ready to give an answer for the hope that we have. Like Peter's exhortation. 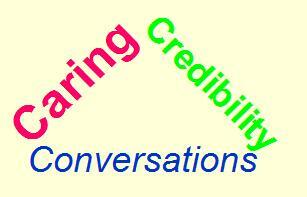 Conversation is our responsibility. Conversion is God's. When the Holy Spirit works, the Word will stick to the person much better than any human devices. Let our lives shine so brightly, that non Christians around us will start the conversation by asking us for the hope we have in Christ. Let our saltiness bring out the curiosity of people to want to talk to us. We believe that there is power in the gospel. Let our belief show forth through honesty and openness to people. That said, we need to establish some credibility by acknowledging that we are not much different from non-Christians in that we too sin. We struggle too. Sometimes, Christians struggle and get persecuted more simply because of our faith. Non-Christians will be very curious to know why we continue to persevere in our belief despite the hardship and persecutions. Do we have a personal story? Do we have a testimony of how God is faithful to us in both good and bad times? Are our actions congruent with our inner faith? When the Holy Spirit works in the hearts of people, there will be credibility as words, actions, and emotions all blend together as one unified whole. Let our honesty, our consistency in witness and in living be a credible witness in itself. The old adage is true. "I don't care how much you know, until I know how much you care." Let our caring touch the hearts of all people, that they will know the source of love is not of ourselves, but of God in Christ. These are three simple suggestions on how we can be part of inculcating a sticky faith. For others and for ourselves. For our families and for our Church. Persevere on. The time will come, when those who persevere will bear much fruit, and cause others too to bear even more fruit. One more thing. Unlike Post-It-Note faith that begins with a solution looking for a problem, may our sticky faith begins with Christ in us, continuing with Christ through us, and sharing the hope of Christ for others.